Official standard of the President of the Russian Federation. Kremlin Senate — the official residence of the sitting President of Russia. 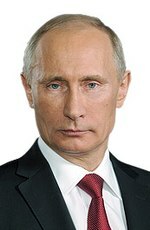 Throughout his presidential terms and into his second term as Prime Minister, Putin has enjoyed high approval ratings amongst the Russian public. During his eight years in office, the economy bounced back from crisis, seeing GDP increase sixfold (72% in PPP), poverty cut more than half and average monthly salaries increase from $80 to $640, or by 150% in real rates. At the same time, his conduct in office has been questioned by domestic dissenters, as well as foreign governments and human rights organizations, for his handling of internal conflicts in Chechnya and Dagestan, his record on internal human rights and freedoms, his relations with former Soviet Republics, and his relations with the so-called oligarchs: Russian businessmen with a high degree of power and influence within both the Russian Government and economy. This was seen by the Kremlin as a series of anti-Russian propaganda attacks orchestrated by western opponents and exiled oligarchs. Medvedev was appointed First Deputy Prime Minister of the Russian government on 14 November 2005. Formerly Vladimir Putin's chief of staff, he was also the Chairman of Gazprom's board of directors, a post he had held, for the second time, since 2000. On 10 December 2007, he was informally endorsed as a candidate for the forthcoming presidential elections by the largest Russian political party, United Russia, and officially endorsed on 17 December 2007. Medvedev's candidacy was supported by former President Vladimir Putin and pro-presidential parties. A technocrat and political appointee, Medvedev - Putin's former Chief of Staff and one-time rival to Sergey Ivanov - had never held elective office before 2008. Medvedev chose Putin as his Prime Minister; in 2012, Putin ran for the Presidency again, won a third term, and appointed Medvedev as Prime Minister. For Russian leaders prior to this ratification, see List of leaders of the Soviet Union, and List of leaders of the Russian SFSR. Born: (1947-09-16) September 16, 1947 (age 71) Non-partisan 22 September 1993 4 October 1993 Vice President De facto, been acting President, during the 1993 constitutional crisis, at the same time with Boris Yeltsin. (1938-04-09)April 9, 1938 — November 3, 2010(2010-11-03) (aged 72) Our Home – Russia 5 November 1996 6 November 1996 Prime Minister Acting President during Boris Yeltsin's heart surgery. Born: (1952-10-07) October 7, 1952 (age 66) Unity 31 December 1999 7 May 2000 Prime Minister The acting president when Boris Yeltsin resigned early. Two presidents held other high federal offices after leaving the presidency. As of April 2019, there is only one living former de jure president (except Vladimir Putin, who was president from 2000 to 2008, and became president again in 2012) and one former acting president. The most recent death of a former de jure president was that of Boris Yeltsin (1991–1999) on 23 April 2007, aged 76 and the most recent death of a former acting president was that of Viktor Chernomyrdin (1996) on 3 November 2010, aged 72. ^ Served as President of the Russian Soviet Federative Socialist Republic de jure within the Soviet Union (but after state sovereignty and referendum) from 10 July 1991 – 25 Dec 1991 after which the office became President of Russia after renaming of country. There is no difference between these office names. 1st presidential term of Yeltsin started in July 1991 and ended in 1996. ^ a b c "Transcripts of 'Insight' on CNN". CNN. 2002-10-07. Retrieved 2007-07-17. ^ Sergey Morozov, "Putin's Diplomacy: Russian Judo on World Tatami". – Saint Petersburg, publishing house "Krylov", 2008. – 288 pp. ISBN 978-5-9717-0630-4. Chapter "Dracula, Rotten Meat and Dr. Evil", p. 130: "... in the Kremlin they thought that Russia has become a subject of a series of political propaganda attacks orchestrated by the West and exiled oligarchs. ", p. 139, Dmitry Peskov: "Things we observe in the British media relate more to a usual human hysteria rather than to journalism... President regards this calmly, understanding at the same time that this has nothing to do with journalism and analytics." Boris Yeltsin, the first President of Russia, died of cardiac arrest on April 23, 2007, twelve days after being admitted to the Central Clinical Hospital in Moscow. Yeltsin was the first Russian head of state to be buried in a church ceremony since Emperor Alexander III, 113 years prior.